The best priced Catholic gift Bible available in New American translation. This is the best priced Catholic gift Bible in the New American Bible translation. 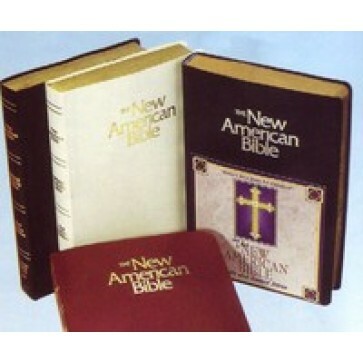 It is available in imitation leather colors of black, burgundy, blue, white, green and comes with many features including: book introductions, list of the Popes, maps, presentation page, parables, miracles and discourses in chronological order, specific Catholic teachings footnoted, words of christ in red. Gold Stamp available, please call to inquire.